The agreement calls for selling participation in two pre-salt oil areas, fifty percent of two thermal plants and shared use of a regasification terminal. SÃO PAULO, BRAZIL – Brazil’s oil giant, Petrobras, announced that it signed a Master Agreement with the French petroleum company Total, in connection with a Strategic Alliance Accord signed in October. In the agreement, Total will pay US$2.2 billion in the way of cash and investments in return for participation in several sub-salt oil fields. According to local media, Petrobras will receive US$1.6 billion upfront in cash. Petrobras’ CEO, Pedro Parente announces agreement with France’s Total, photo by Valter Campanato/Agencia Brasil. 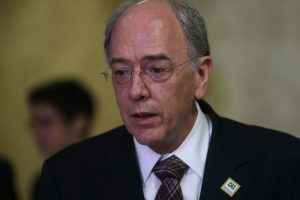 “What we want with this whole program is to have resources to help pay our debts,” Petrobras president Pedro Parente said in an interview at the company’s headquarters in central Rio on Wednesday night. Among the items in accord are the sale of participation in two pre-salt layer areas – 22.5 percent interest to Total in the Iara area, and the sale of 35 interest in the Lapa field with Petrobras retaining a ten percent interest in the concession, – as well as the shared use of the Bahia regasification terminal, with a capacity of 14 million m3/day and a partnership, with Total holding a 50 percent share, in two thermal plants located in Bahia. The two companies will also conduct joint studies in the exploratory areas in the Equatorial Margin and in the southern area of Santos Basin, and construct a technological partnership in geological processing and subsea engineering. “It is a partnership that makes a lot of sense for Petrobras and we are very pleased to have reached the point where we have concluded this general agreement, with the signing of the specific contracts,” added Parente. The start of the framework of the agreement was announced in October at the Rio Oil and Gas Expo, the largest oil and gas exposition in Latin America. Petrobras and Total already have partnerships in nineteen exploration and production consortiums in Brazil and abroad, including in the sub-salt layer in the Libra area. The two companies are also partners in the Bolivia-Brazil gas pipeline.